IRONDALE, Ala. (CNS) — In an early morning tweet Feb. 22, the Eternal Word Television Network said its founder, Mother Angelica, remains in a “delicate” condition. Members of her religious order, the Poor Clares of Perpetual Adoration at Our Lady of Angels Monastery in Hanceville, asked for prayers for her. In a new posting on the order’s website, http://olamnuns.com, the Poor Clares extended “a heart-felt thank-you” to all who have been praying for Mother Angelica, who is 92. Last November, a spokesman for the Poor Clares told Catholic News Service, that Mother Angelica was doing as well as could be expected for someone her age who remains partially paralyzed. “From what I’m told, it’s not that she’s completely unable to eat. It’s assisting her to get the nutrients she needs,” said Luke Johnasen, director of pilgrimages at the monastery. He confirmed to CNS that she had been fitted with a feeding tube. In the website posting, the Poor Clares said that toward the close of 2015, the entire community of the Franciscan Missionaries of the Eternal Word, based in Birmingham, came together to celebrate a special Mass for Mother Angelica. It was “another gift of God’s mercy. Mother herself is regularly fortified by the sacraments,” the order said. On Feb. 12, Pope Francis sent his greetings Mother Angelica from aboard the papal plane to Cuba for his historic meeting with Russian Orthodox Patriarch Kirill of Moscow. EWTN released the pope’s message for Mother Angelica later that day. 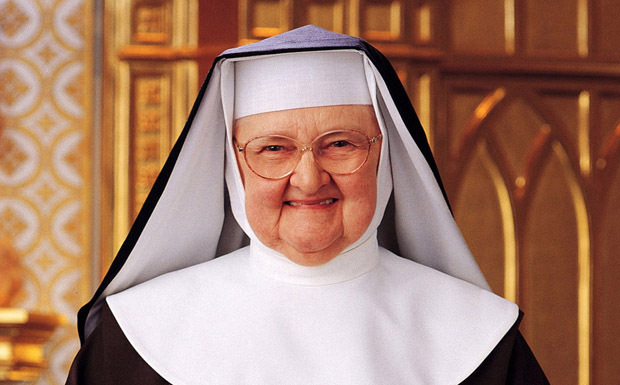 A native of Canton, Ohio, Mother Angelica launched EWTN Aug. 15, 1981. The initiative was met with doubt from television executives who felt there was little demand for Catholic programming. The networks’ website reports that it transmits programs 24 hours a day to more than 230 million homes in 144 countries via cable and other technologies. It broadcasts in in English and several other languages.